It has long been known that healing many areas of the body cannot take place without appropriate oxygen levels in the tissue. Most illnesses and injuries occur, and often linger, at the cellular or tissue level. In many cases, such as: circulatory problems; non-healing wounds; and strokes, adequate oxygen cannot reach the damaged area and the body's natural healing ability is unable to function properly. 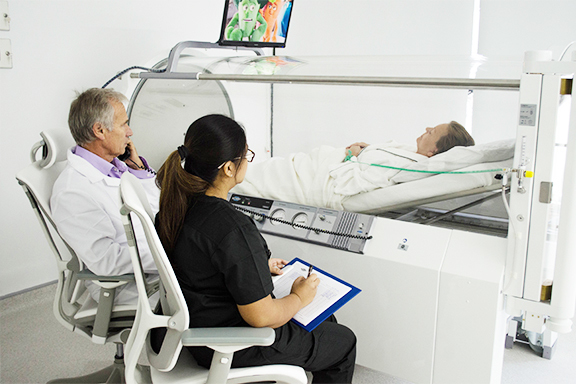 Hyperbaric oxygen therapy provides this extra oxygen naturally and with minimal side effects. Hyperbaric oxygen therapy improves the quality of life of the patient in many areas when standard medicine is not working. Many conditions such as stroke, cerebral palsy, head injuries, and chronic fatigue have responded favorably to HBOT. The most common side effect is barotrauma to the ears and sinuses caused by the change in pressure. To minimize this risk, patients learn techniques to promote adequate clearing of the ears during compression or tubes may be inserted in the ears. Only clean cotton clothing is allowed in the chamber. No cosmetics, perfumes, hair preparations, deodorants, wigs or jewelry are allowed in the chamber. The technician needs to know if any medications, including non prescription drugs, are being taken by the patient, and patients are advised not to take alcohol or carbonated drinks for four hours prior to treatment. In most cases, patients should give up smoking and any other tobacco products during their treatment period, as they interfere with the body's ability to transport oxygen.